Once again we are excited about our annual missions conference! Last year’s conference was tremendous! Three missionary families, as pictured above, were present with us last year and now, a year later, all three have moved to their fields of service. The Steven Barnes family are now in Guam. Jonathan and Ashley Beadles are serving in Colombia, South America and the Dan Tribuzios are in Australia. 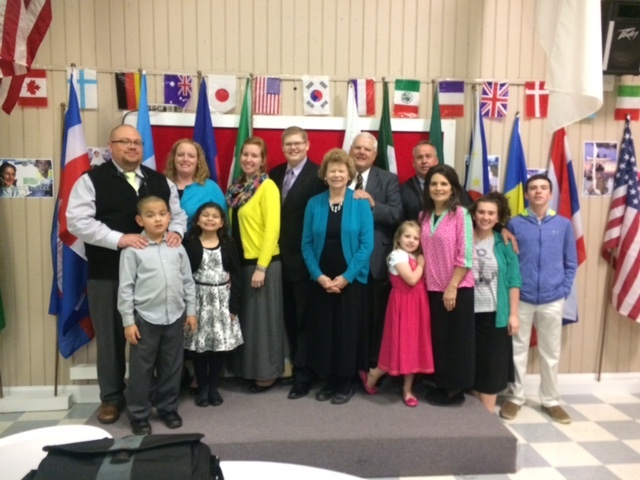 We thank our Lord for these families that have sacrificed much to go to “the uttermost parts of the world” for Him. They and our other faithful missionaries are serving and taking the Gospel where we can’t go. This year our guest preacher is Pastor Ed Bragg from Missouri. He will be a blessing. We will also have 2 missionary families with us: the McDonald Family who are going to Kenya and the Nichols Family who are going to Brazil. Both of these families are currently on deputation. Service times are Wednesday and Thursday, March 7 and 8 at 7:00 PM. Friday, March 9th at 6:00 PM we will have our International Supper followed by the evening service. Our conference will continue through Sunday, March 11th for all services. We encourage all members and friends of Calvary Baptist Church to be present for each service. As always we extend a warm welcome to visitors. It will be a challenging and encouraging time as we follow our Lord in doing our part for missions. Don’t miss the blessings the Lord has in store for each of us!